Developers have to do coding on the server side and client side. Client-side coding is responsible for generating requests to the server. And server-side coding is responsible to satisfy that request. 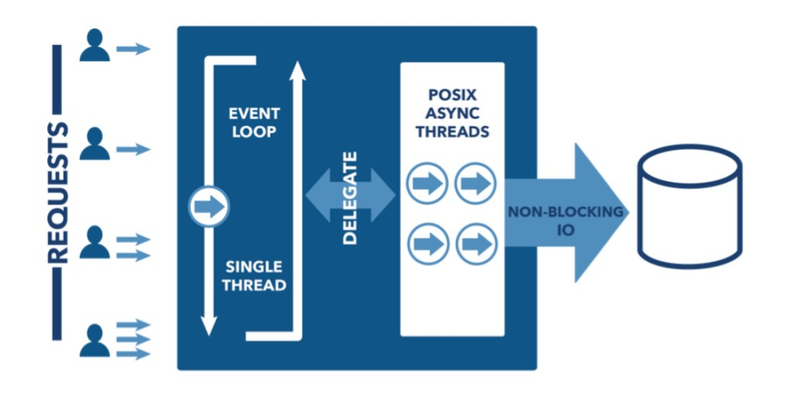 More I/O operation because of Single thread: Unlike node.js, all other server-side technologies like Ruby, PHP, ASP.NET are having multi-thread structure. That means each request is being handled by each new thread. But Node.js is having a single thread. All request is being processed by a single thread. But wait? This is half true. The real scenario is, a single threat is working with so many back workers, stored in an internal thread pool. So when any new I/O request comes, a single thread catches it and intermediately send it to the related back worker. That back worker is responsible for analyzing the request, processing of the request, preparing response and sending the response to the client. This is why node.js can process more request than traditional server-side programming technology. It can be used in real time application: We have spent a lot of time developing a typical request/response model based application. But this is the era of the real-time app, where all operations are counted in second. For example, if someone sends you a message and you receive it, is the best example of an app. Because of Node.js’s nonblocking property, it becomes so easy for a developer to make a real-time application. Easy Data streaming: In a usual web platform, request and response are called data streams which can be used more efficiently in node.js. In node.js, data is coming back to the client while some of the remaining data is still uploading. So, it doesn't wait for all data to collect. This is how it reduces the overall processing time and shows fast results to the client. Now, let’s know what are the top companies which are taking advantage of the node.js to streamline their business. Linkedin is the employment-oriented service provider company which is having a mobile app and website. It was founded in 2003 with the aim to provide a platform to the people to increase the professional networking. As of March 2019, 610 million users of 200 countries are using the LinkedIn platform. What was the need to migrate from Ruby on Rail to node.js? Till 2011, LinkedIn’s mobile and web services both are based on Ruby on Rail. According to Ikai Lan, who worked in the mobile server team at the LinkedIn, they wanted something which doesn’t block the entire process to complete a request. Even Deepak Gupta who is a senior software engineer at linked said that they hate that with a lot of people, the processing time of request becomes slow. With node.js, they have achieved an asynchronous event-based system, which allows the server to handle more client at a time than any other. After migrating to node.js, the LinkedIn mobile app runs 20 times faster and they have cut servers from 30 to 3. PayPal is the online platform for receiving and sending money between individuals. It was started in 1998 by Ken Howery and his team of three people. During the initial days, the company has seen a very good success rate. In fact, the daily growth of the company was 10% and Till 1/1/2019, Paypal has 267 million active personal accounts and 21 million merchant accounts. What are the technologies PayPal has tried? What was the reason to migrate? After migrating to node.js, PayPal has achieved something they were not expecting. App of PayPal becomes twice as fast as it was. Coding lines have reduced 33% and the number of constructed files reduced to 40%. Netflix is the media service provider company which was founded in 1997 and have headquarter in California. Netflix’s primary service is to let people stream shows and movies through the web and mobile platform of the company. Currently, Netflix has 148 million users with revenue of $15.794 Billion. An app with the node.js at the front and back-end side opens 70% faster than the previous version of the app. Uber is offering peer to peer ride sharing and ride-hailing. It is a California based company, having 16000 worldwide employees. The revenue of the Uber in 2018 was $11.3 billion. Apart from this, Uber is estimated to have 100 million users. What Uber is known for is a hassle-free ride booking service. With few clicks on the mobile app, a person can book the ride. Why Uber decided to go for node.js? There is a lot of networks requests Uber has to process in a single time. Thanks to node.js, Uber’s network request can be easily solved in a more efficient way. In the pick time, Uber has to process 2 million requests per unit of time which is now possible with node.js. Another reason Uber has adopted node.js is easy coding. In node.js, while development, it is very easy to inspect and change the program. Groupon is an American company, providing E-commerce marketplace of travel, goods, and services. The initial operational area of the Groupon was in Chicago and later it expanded to more than 150 cities. Currently, it is available in more than 500 cities across 40 countries. In 2017, Groupon was successful to generate a net income of $14.4 million. Why Groupon jumped into node.js? With node.js, Groupon becomes a performance beast. It can response now more than 425000 requests in a single time. Also, according to the official statement of the Groupon, they are serving the same amount of traffic but now with the less hardware and less hardware cost. Yes, you guess it right. Development ways of the web and mobile apps are changing like never before. Node.js is one of them. With the node.js, it becomes so easy to do server-side coding in such a way that a company gets maximum efficiency. Node.js is very helpful and suitable from a small startup business to all big enterprises as it provides a user-friendly experience to the users of the service. Node.js is not a school where to know the result students have to stand in the queue and check it manually, node.js is the university where all students get the result in the personal mail as soon as result gets declared! what is node.js node js famous applications web and mobile app development 2019.